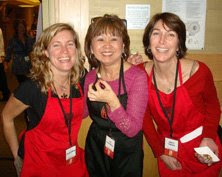 Sushi addicts (you know who you are) will achieve bliss at the perfect culinary event for nigiri fans and Japanophiles. Our hugely popular annual Sushi & Sake Fest takes place November 5, 6:00 pm to 8:30 pm, at the Seattle Westin Hotel. Attendees can savor inventive sushi and appetizers prepared by chefs from eight local restaurants, including Nishino, Mashiko, and Sushi Zen. It gets better: You can pair your spicy tuna tartar and crunchy tempura roll with premium sake from about a dozen makers, such as Gekkeikan and Takara. Or opt to quaff beer from the likes of Sapporo and Rogue. This is no boring fundraiser -- this is a big party. Between visits to the sushi stations and sake bars, you can bid on silent auction items (like art by Shimomura, Tsutakawa, Okada), listen to jazz and taiko drumming, and watch the action painting by BOSSHIKO of Osaka. We're inviting old and new friends, and asking them to bring their friends to the party. Your day-after-the-election evening at the Westin will not only sate your craving for sushi and sake; it will earn you good karma. The $75 general admission ticket ($45 tax deductible) supports Densho's work to prevent historical amnesia and protect civil liberties. Our mission is serious but our event is ... delicious. Don't miss it. Oishii!